One of the most useful products, padded bags are used widely in mailing and fulfillment operations to cushion and protect a wide range of products. In fact, padded bags can be used for anything that's small that doesn't require a larger package, items like books and small samples. The list is virtually endless. One of the most common alternatives, paper bags are used for separating multiple items in a shipment. Among their advantages: They are easy to write on and they are relatively inexpensive. Because they are manufactured with Kraft paper, they are strong and can be used for small, heavy items like nails and screws in hardware operations. Because they are light-weight, bubble mailers can reduce overall shipping costs. 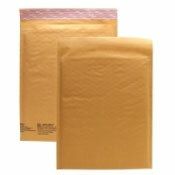 In fact, bubble mailers have only 1/3 the weight of padded bags, so you can gain in reduced mailing costs. Because of their strength, padded bags are most useful in protecting harder and sharper items, like bolts and drill bits, during shipping. 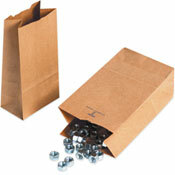 Paper bags can be used for separating different sizes of items, like plumbing fittings, screws and nuts. Measuring - When utilizing bubble bags, going by the outside dimension of the bag instead of inside dimensions may give you a bag that is too small for your item. With padded bags, users should be clearly instructed to use the tear strip, because if they don't, the bag will rip and spill its stuffing. Padded bags are made from 100% recycled materials, and are completely recyclable. These Kraft paper shipping bags are lined with shredded - or macerated - paper to provide heavy-duty protection. Each bag has a self-sealing adhesive tear strip to quickly and securely seal the bag. The user simply peels and seals. In addition, the bags can be reused for increased cost-effectiveness. One option is to utilize custom-printed labels for end-user information, advertising and increased market exposure. 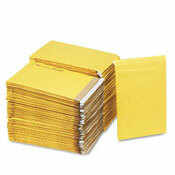 Click Here to see available Bubble Mailer Sizes. Bubble mailers are shipping envelopes lined with bubble wrap. Our bubble mailers are made from 100% recycled golden Kraft paper with a 3/16-inch bubble lining. They have a self-sealing adhesive strip to quickly and securely seal the bag. Variations of this product line include media mailers, anti-static bubble-lined mailers and bubble pouches. Paper bags are available in numerous variations. Kraft grocery bags come in 2-lb. to 25-lb sizes, and they are available in natural Kraft and white, shopping bags with rope handles, millenary bags and notions bags. Sizes range from 4 x 5 inches to 24 x 6 x 30 inches. Test weights run from 30 lbs. to 70 lbs. Kraft paper.